The most traitorous act about this British spy story would be to admit that one didn’t like (Dame) July Dench’s performance as the octogenarian widow suddenly arrested by the Authorities for what she got up to at University in the 1940’s. The hesitation is not a reflection of her in anyway, but in the leaden and predictable script that lacked any of the usual element of surprise one expects from a thriller. Vaguely based on a true story and directed by the multi-award winning theatrical director Sir Trevor Nunn whose infrequent forays behind a movie camera have had patchy results . This maybe qualifying as one of the worse. 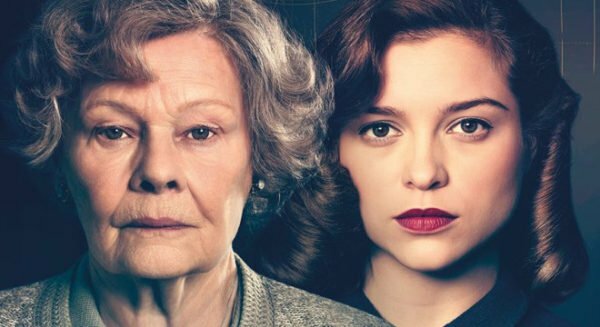 The story starts when the Authorities investigating the sudden death of a high ranking Foreign Office Official who they suspect was a Russian Agent and in trawling through his history come across evidence that links Joan Stanley (Dench) to the same spy circle that started at Cambridge University before WW2. Young Joan had been wooed by Leo (Tom Hughes) a young German student when she had attended the Socialist/Communist Club as if it were just another college social event. After she graduated with a First Class Honors degree in Physics she was invited to become the P.A to Professor Max Davies (Stephen Campbell Moore) working on a top secret project. She loved the work and was smitten with her Boss too but when she realised they are actually involved in splitting the atom in order to make the world’s first nuclear bomb she had second thoughts. When the Americans used theirs to destroy Hiroshima and Nagasaki, Joan feels compelled to act in what she considers is leveling the playfield by ensuring that the Russians should also be able to create their own bomb as a future deterrent. Encouraged by Leo’s glamorous cousin Sonya (Tereza Srbova) Joan starts photographing documents to hand over to the Soviets. When this whole story is revealed 50 years later after her arrest, the reluctant Joan confesses that the accusations of spying are true but she is adamant that she was only motivated by the idea of peace. She claims that he fact that there hasn’t been a World War since, justified her actions. Dench serenely plays the elderly frightened woman who is finally forced to deal with the past that she had kept from everyone, including her son (Ben Miles) a successful Barrister who is appalled by this discovery motivated by the fact that it will ruin his career. In all the flashbacks young Joan is played by Sophie Cookson who is never valued for her true worth simply because she is a woman. Whether that played a part in her reasoning to pass on classified documents is never clarified, but because of her gender it was easier for her to spy as no one would ever suspect a woman. …..so hence her innocent boss gets arrested instead. That fact that her actions may be explained by her being in love wouldn’t ever convince anyone as the total lack of chemistry between the lovers was almost painful to watch. The film will make you rethink that the Brits are always masters at the genre period dramas you but if you are an avid fan of Dench and will watch her regardless of the material then no doubt you’ll still sit through this one too. Otherwise this is definitely one to pass on.